Sustaining diverse soil microbes begins by feeding soil microbes differing “food” sources. If you look at the plant root, you would see numerous colonies of different microbial communities at different locations in the rhizosphere. Each colony corresponds to a different organic plant exudate. Different microbes break down different exudates. The plant exudes a diverse “buffet” of carbon exudates to support a diverse microbial population. Shouldn’t our fertilizers follow suit?When you go to eat at a buffet restaurant, do you only eat one item off the buffet? No, you go to the buffet for the diversity of food sources. 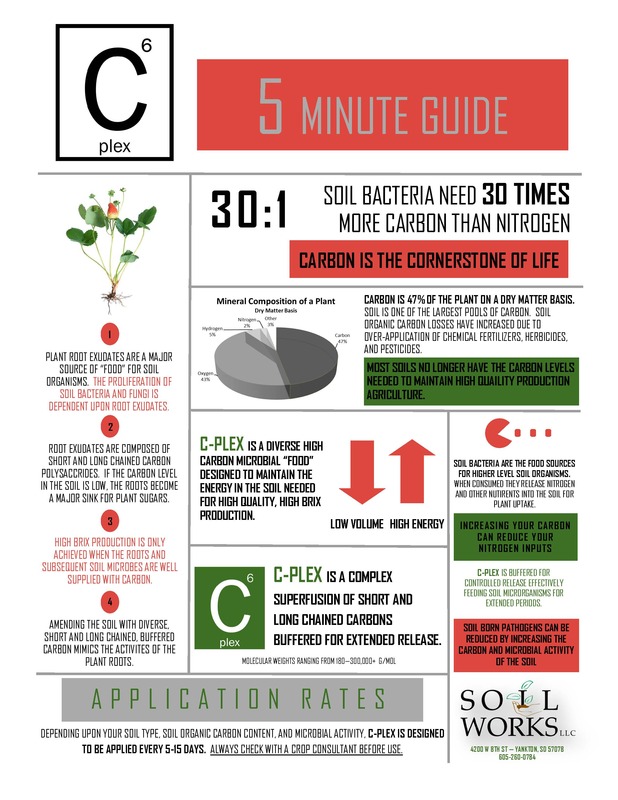 C-Plex is a diverse buffet of carbon sources designed to support a varied population of soil microorganisms. When “BRIX” are low, or the carbon content of the soil is low like in sandy soil conditions, the soil and/or plant cannot support the diversity of soil microorganisms. In these soil environments, we tend to see the soil express low diversity and low microbial populations due to limited “food” sources. C-Plex is a diverse carbon source with molecular weights ranging from 180-300,000+ g/mol. This diverse buffet of microbial food is buffered to reduce interference when tank mixed. C-Plex is specially formulated as a long-term carbon source. Our goal is to support the proliferation of soil microorganisms throughout the growing season giving your soil the energy it needs to support nutrient dense quality production.